High quality and durable mini table soccer balls, this set of balls is just what the foosball enthusiast needs. Let your imagination run wild with these mini foosball table sized plastic balls for art projects, football soccer birthday decorations, classroom rewards or child’s play activity! These hot toys are a must for world cup soccer fans. These mini plastic toy balls fit almost any soccer game table. Perfect replacement balls for any standard fooseball table! This is also wonderful choice for children activities on a rainy day. Use them for some birthday goodie bag stuffers, on sports game day table and birthday party games. Balls measure 36mm (1.4″inches) in diameter. Great replacements for well-worn and damaged foosballs. Pair these fun sports balls with other novelty toys, DIY art projects, crafts toy accessories, and birthday party favors. Makes the perfect pastime activity for a rainy day at home or school recess playtime. Excellent size for most standard foosball table games. 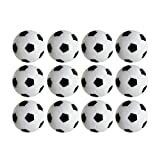 High quality and durable mini table soccer balls, this set of balls is just what the foosball enthusiast needs. Let your imagination run wild with these mini foosball table sized plastic balls for art projects, football soccer birthday decorations, classroom rewards or child’s play activity! These hot toys are a must for world cup soccer fans. These mini plastic toy balls fit almost any soccer game table. Keep the fun table games going with these replacement durable bright foosballs! A must for leisure sports in any game room. Makes the perfect outdoor toys for carnival prizes, Pinatas, or with other fun gag gifts. These kids toys are the perfect pairing for game day school rewards and prizes for children. Have these essential soccer ball birthday party supplies ready for your next special event. Makes the perfect prize in kids party favor bags, party favor boxes, mixed with pinata candy and as party favors for adults. Foosball measurements in diameter: 36mm (1.4″). Comes in a package of 6 foosball replacements. Each ball weighs 24 grams. Colored in black and white with engraved traditional soccer ball pattern.